If more movie stars played snooker, the world would be a better place. For snooker involves a very different set of disciplines to acting. 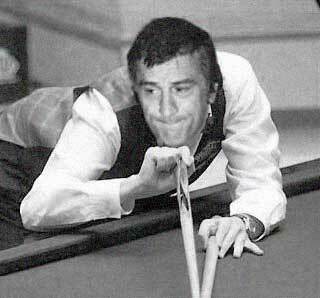 Robert De Niro isn't a very good actor anymore, but he is steadily climbing the snooker rankings. He's hoping to be in the provisional top 16 for next season. That will guarantee he doesn't have to endure the indignity of the qualifiers for next year's World Championship. In order to maintain some balance, Jimmy White has been drafted in to replace De Niro in four major Hollywood roles this year. The most exciting is surely in Bad Men in which he will team up with Edward Burns and Adrien Brody as a corrupt cop who falls for a showgirl. At the very least we will be spared De Niro's traditional "amusing" send up of his Travis Bickle character. At no point will Jimmy ask a character if he is "talkin' to me?". A relief for movie-goers of all ages. 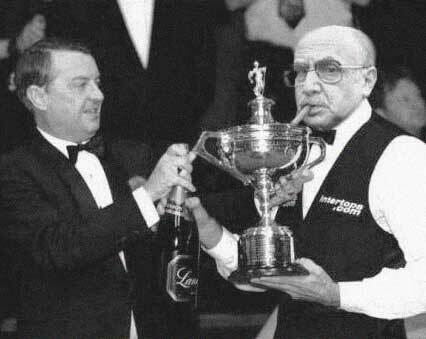 I don't like to boast, but that is my dad winning the 2001 Snooker World Championship. You might have thought that Ronnie O'Sullivan won, but that's just what the media want you to believe. It may come as a blow to some of you, but I must inform you that Ronnie O'Sullivan doesn't even exist. He's a computer-generated character that the World Snooker Federation created to help the sport appeal to younger viewers. He head was superimposed on my dad's body throughout the tournament. That is why there is a 20 second delay before broadcast, so the computer technology can do its magic. In the biz, people call Ronnie "Lara Croft" because he's just a virtual player. Anyway, my dad won. (He beat Ken Docherty 19-14) but he doesn't drink - and he even stopped smoking cigars after the tournament - so I drank the magunum of champagne. I was very pissed that evening. This page was brought to you by the Global Snooker Combustion Agency.